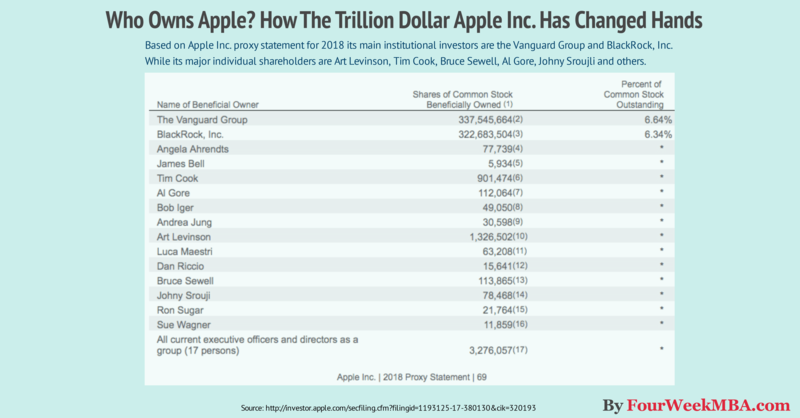 Based on Apple Inc. Proxy statement for 2018 its main institutional investors are the Vanguard Group and BlackRock, Inc. While its major individual shareholders are Art Levinson, Tim Cook, Bruce Sewell, Al Gore, Johny Sroujli and others. What about Steve Jobs and Steve Wozniak, its mythical founders? Do they still Apple? Does Steve Jobs still own Apple’s stocks? Does Steve Wozniak still own Apple’s stocks? Had Steve Jobs kept its Apple’s IPO stocks until the end he’d probably be worth over a hundred billion dollars, considering that Apple in August 2018 Apple surpassed a trillion dollar market cap and Steve Jobs initially had an 11% stake of the company. However, when he left the company – after he was ousted – he sold its Apple stocks in 1985. He used that money to buy Pixar. In 2006 Pixar got sold to Disney, and Steve Jobs got in exchange around 8% stake in the company. As shown in Walt Disney financials, Laurene Powell Jobs Trust still owned 7.8% of the company’s stocks in 2016, corresponding to 128,301,176 shares. As of 2018 that information is missing which tells us that Jobs’ wife sold part of those stocks. Thus, going below the 5% shares that makes it mandatory for her to report on Walt Disney financials. Those stocks which amounted to 5,546,451 consisted of the 0.60% of the company (on a total of 921,043,522 shares at the time) which was held indirectly through a trust fund. We don’t know how many stocks of Apple and Disney the trust run by Jobs’ wife owns. As the ownership has gone below the 5%, there is no obligation to file a report as a shareholder. That is why in Apple’s. Ownership you might not see Steve Jobs. And when Jobs (in the movie, but really a board does this) denied stock to the early garage team (some not even shown) I’m surprised that they chose not to show me giving about $10M of my own stock to them because it was the right thing. And $10M was a lot in that time. Referring to the fact that Jobs had denied stock options to one of the early Apple employees from day one. Steve Wozniak gave away $10 million of his stocks. In short, as of now, Steve Wozniak net worth seems to be around $100 million. Thus, even if that is expressed in Apple’s stocks that are way less than 5%. Below the amount required to be reported by law. That is why you might not see Steve Wozniak among the Apple Inc. Investors. What about the other investors? Apple’s mythical founders Steve Jobs and Wozniak are missing as they now own less than five percent of the company’s stocks. Art Levinson is an American businessman and Chairman of Apple Inc. since 2011. He was addressed Chairman to replace Steve Jobs in 2011, after his death. Apple’s CEO Tim Cook was the former COO (chief operating officer) under Steve Jobs. Graduated from Auburn University in 1982, Cook spent 12 years in IBM. He joined Apple in 1998 until he became CEO in 2011. Sewell is an Apple’s executive who joined the company from Intel Corporation in 2009. He announced his retirement in 2017 after eight years of leading the company’s legal and security efforts. On February 2017 Al Gore sold part of its Apple stocks – more precisely he sold 215,437 stocks at a $136.72 as reported to the SEC – which netted him over $29 million. According to the Apple proxy statement he still owns 112,064 shares which if he was going to sell at current price – $215.36 – he could sell for over $24 million. Johny Srouji is Apple’s senior vice president of Hardware Technologies, which now reports to CEO Tim Cook. He joined Apple in 2008 after working at Intel and IBM. Apple Inc. had a troubled history where it changed in ownership several times in the course of its history. When the company was going public Steve Jobs didn’t recognize ownerships to some of the early employees. That is why Steve Wozniak sold at a symbolic price $10 million worth of stocks to those early employees. Thus, he became a minor shareholder in comparison to Steve Jobs. When Jobs was ousted from the company in 1985, he sold his Apple shares and moved on to Pixar. When Pixar got acquired by Disney, Jobs got almost 8% of the company. At his death, the shares went to its trust, now managed by his wife. Part of the stocks in Apple and Disney were liquidated below the 5%. Thus making it impossible to know exactly how many shares the Jobs Trust owns. Now Apple Inc. is owned by two main institutional investors (Vanguard Group and BlackRock, Inc). While its major individual shareholders comprise people like Art Levinson, Tim Cook, Bruce Sewell, Al Gore, Johny Sroujli and others. To notice that former US Vice President, Al Gore, has been in Apple’s board of directors since 2003. Back in 2017, Al Gore sold part of his shares for over $29 million. Now he owns a remaining 112,064 shares that at today value are worth over $24 million.